Perhaps you had a solid career path planned out, but life got in the way and threw you off course. It can be quite a challenge to try to re-enter the workforce after taking a hiatus, and many struggle with where to start. You can, however, follow these simple steps which just might give you the kick-start you need to get back on track with your career. Technology advances rapidly and jobs evolve all the time. Chances are, the position you are eyeing may now require different things from candidates than it did when you were last employed. Make sure that you know the current ins and outs of your targeted position, such as skills that are in demand, and issues that are relevant to the industry. So whether you were away for a year or ten, do your research. Follow the activities of notable people within the industry, and read related blogs and articles. You can also look into applying for jobs in smaller businesses. Positions here may be less coveted by other jobseekers, which could mean less competition for you. Volunteering is a great way to fill in the gap in between jobs. Aside from being charitable (always a desirable trait), you can also acquire transferrable skills that will look good on your résumé. For instance, you can advance your communication and marketing skills while working on fundraisers. Being involved in volunteer work can expand your network as well. This will be helpful when you need references to put in a good word for you, or simply to give you a heads up on job opportunities. Being away for a long period means that your knowledge and expertise might become outdated. Companies are often restructuring and modernising, so you have to keep up lest your skills become obsolete. Fortunately, you can get help for that. 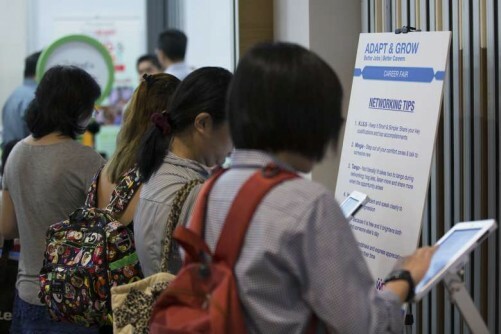 SkillsFuture, for example, is a national movement aimed at enabling all Singaporeans to take up training opportunities to improve employability. One the programme’s initiatives, SkillsFuture Credit, offers all Singaporeans aged 25 and above an initial credit of $500 from January 2016. This credit can be used to pay for or offset the fees for skills-related courses approved by SkillsFuture Singapore (SSG). Workforce Training Support (WTS) is another scheme that lowers training cost and provides an allowance for individuals who take up training without the support of an employer. Workforce Singapore (WSG) is a site with abundant information on SkillsFuture, WTS, career centres, various career support programmes, and more. If you need something that allows for a flexible schedule, online courses are aplenty on STJobs. The site provides resources like résumé builder, interview tips, job-seeking guide, Training & Development, career change and online courses in partnership with Udemy. Now that you have done volunteer work and upgraded your skills, it is time to update your résumé. Be sure to include any experiences you had gained by taking on relevant projects. Think about the format too. A format that emphasises your skills and expertise might work in your favour more than a chronological format listing your past jobs (which can make the employment gap more apparent). Remember to nail your cover letter as well. After doing everything in your power to maximise your employability, you will realise that a momentary setback should not have a permanent impact in your career. To help your potential employer understand that, just keep in mind that honesty is the best policy. Every interviewer will ask about your hiatus, so don’t expect to avoid the question. Instead, explain truthfully why you took the break, and why you believe that now is the right time for you to be back. Be confident and show that you are ready to be committed to the job for a long time.